1. Harry and Kurtz leave Harry’s apartment. 2. A friend of Harry’s (Mr. Popescu) waves at him from across the street and as Harry steps into the street and is hit by a truck. 3. Popescu and Kurtz carry mortally wounded Harry across the street to the square in front of the statue of Emperor Josef. 5. Harry dies before the ambulance arrives. 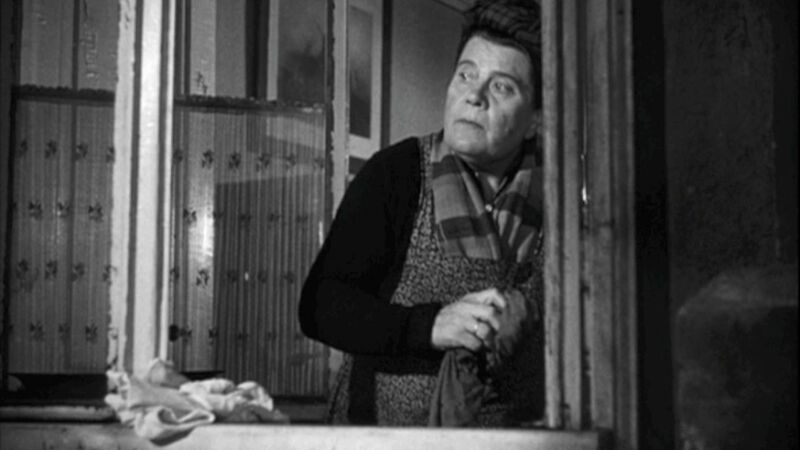 As she hears the name Popescu uttered, the porter’s wife loses her ear-to-ear smile, throttles the kitchen towel she is holding, and hurries to call the porter away in German. A closer investigation of the script shows a couple of things. First it shows that I certainly don’t speak German, and the powers of Google Translate to shed light on its meaning is lacking and full of ambiguity. What is interesting to me is the last line that the porter’s wife uses to pull him out of his involvement with Holly and Kurtz. She says, in a language that everyone but Holly understands, “Du musst zum telephon,” which roughly translates to “You must come to the telephone.” What is striking about this wording is its ambiguity. How does the porter need to interact with the phone? Is there a call for him or does he need to call and report in to some authority? And why does the word Popescu elicit this response? Is the phone call a report suspicious activity to the police—because of Popescu’s infamy—or is it a call to warn Popescu of Holly’s investigation? Whatever the cause, it is clear that the porter’s wife is more interested in getting him disentangled from Kurtz and Holly than he is. The question left burning is, for whose benefit? The porter himself or the notorious Popescu? As an interesting if sophomoric side note, while trying to translate the German dialogue for this scene, I discovered something that German speakers already know. The word “verkehrt” that Kurtz uses to ask the porter who visited the apartment does mean “visit” or “traffic” but it also has a colloquial connotation that might foreshadow the introduction of our next big character, Fraulein Anna Schmidt. *Keep this series of events in mind, since the slight additions and amendments to its order and causality make up the heart of Holly’s investigation. Despite its centrality to the storyline, we never actually see any of it reenacted, we just hear characters describe the scene.